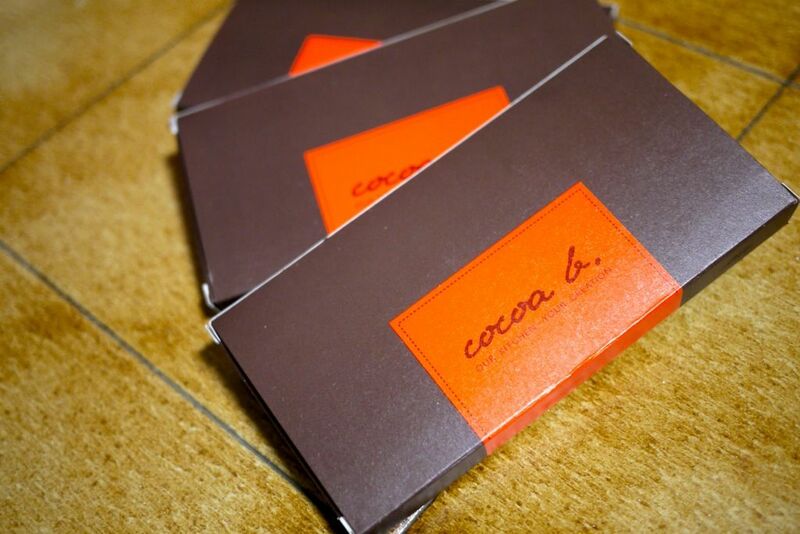 Ms Skinnyfat: Chocolates: Cocoa B. Was sent some customised chocolates by the nice folks at Cocoa B. These guys do a unique chocolate concept where you can create your own chocolate bars online. I heard that they do exotic flavors and hence i made use of this chance to try out some interesting combinations. First, pick the chocolate bar flavor. There are 2 sizes, 50g ($3.90) and 100g ($7.50). Choose from White, Milk and Dark. I love the milk and dark chocolate and i think the texture of their chocolates are really dandy. They taste rich without being too heavy and it's easy to finish a bar in no time (S would do that). 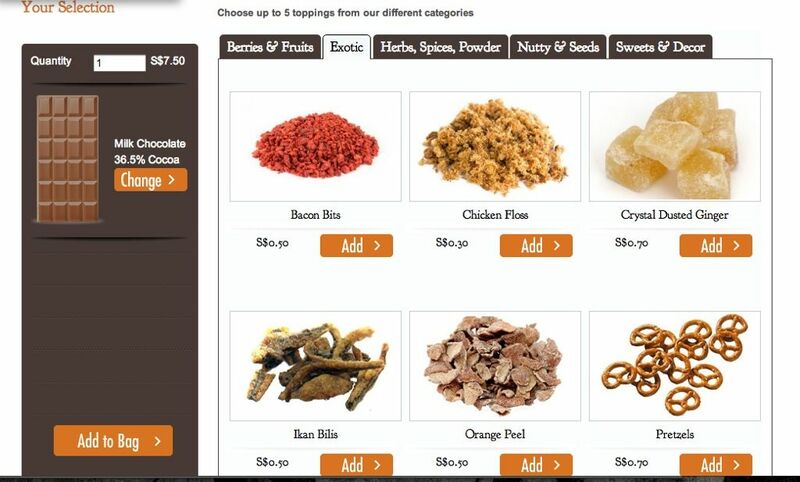 Next, select your toppings from 5 categories. A maximum of 5 could be selected, any more and there wouldn't be space for the toppings. I was really excited about having bacon in my chocolate. Imagine that smoky and savory flavor in bitter dark chocolate. I threw in chili flakes from the herbs category as well. 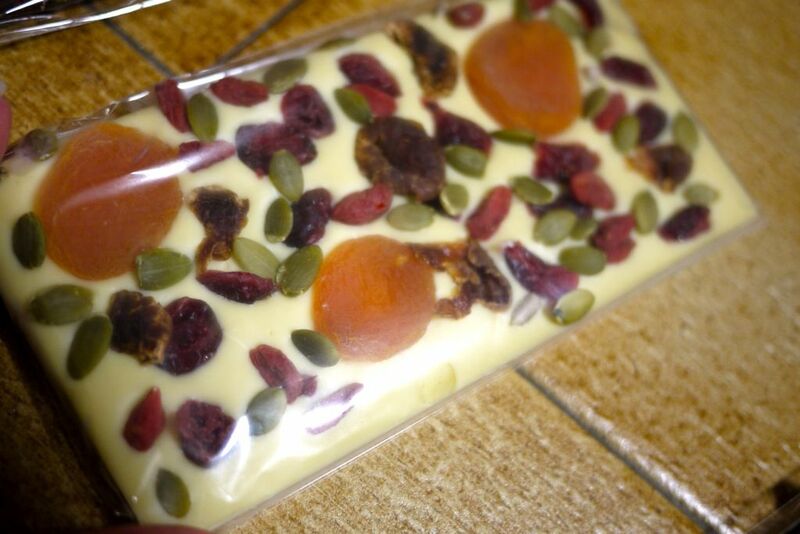 To give it some crunch and sweetness, i balanced my bar with some raisins, almonds and pumpkin seeds. Doesn't it look pretty? I shared this bar with my colleagues and everyone loved it (with the exception of T mama). The flavors were exactly what i expected it to be- a light touch of spiciness, a hint of savory crunch and then mellowed sweetness of the raisins. YUMS. Other interesting toppings include ikan bilis, chicken floss, garlic, cajun spice and more. Let your creativity fly. Don't quite know how to design your own bars? Check out Cocoa B's creations. There are 11 to choose from.